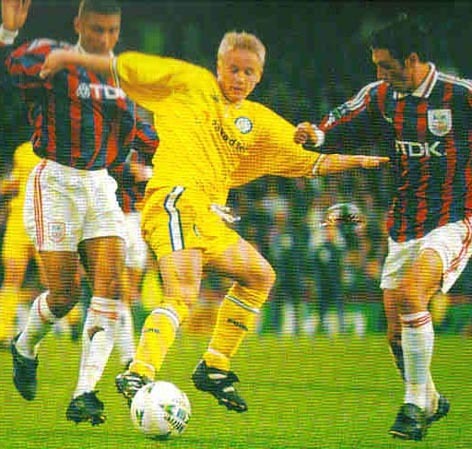 Knarvik played junior football in his native Norway for IL Skjegard from 1992 until 1st June 1997, when he joined Leeds United. He was part of the wonderful young Leeds team that took out the FA Youth Cup in 1996-97 and also a member of the 1997-98 Pontin’s League winning team and that provided so many future stars and internationals for the club. He barely made it into the Leeds first-team statistics as he was given his debut, as a substitute, as was Matthew Jones, in a fine Leeds performance, in a 5-1 thrashing of Portsmouth at Fratton Park in the Fourth Round of the FA Cup in January 1999. Knarvik came on as an eighty-sixth minute substitute for Gunnar Halle so his United first team career lasted just four minutes. Knarvik performed well at Youth and reserve level but found himself well down the pecking order as Leeds bought players to further strengthen their team and supplement their emerging young stars. He was selected as the United Young Player of theYear and considering he was up against Harry Kewell and Jonathan Woodgate and the other galaxy of stars it was no mean feat. He also suffered from an injury which side-lined him for a while and, in May 2000, he had his contract cancelled and he moved back to Norway. He signed for top Norwegian side SK Brann from his hometown of Bergen and was converted to a striker. After a few good seasons at SK Brann his performance dropped and he was loaned out to Bryne FK but they would not offer a regular contract and after six games he returned to Brann who released him after he had scored twelve League goals in eighty-four appearances for them. He scored a further ten goals in twenty-one Cup and European games. Adeccoliga club Sogndal gave him a chance but his performance was not up to standard and they let him go after just one season in 2005 in which he scored once in sixteen appearances. He joined Sandefjord and scored twelve times in fifty League games for them as well as three goals in eight Cup games. On 14th November 2007 Tromso IL announced they had signed Knarvik on a four year contract. He scored nine League in sixty-eight starts and seven games from the bench as well as two goals in six appearances in the European Cup and once in nine Cup ties before, on 14th March 2011, he signed for Viking FK Stavanger. He played thirteen times for them in midfield, of which seven were as a substitute, as well as one Cup game, without scoring. In January 2012 Knarvik moved to FK Bodø/Glimt where he scored five goals in thirteen League starts and scored once in two starts and one game from the bench in the Cup. In 2001 Knarvik played three times for the Norwegian Under-Twenty-one team.